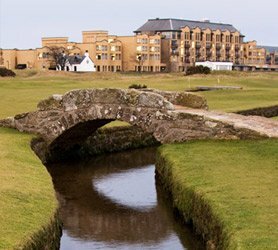 You are here: Home › Blog › #5: Comrie Golf Club: Splendor, splendor everywhere! The course has many challenging holes as it meanders up the hillside affording breathtaking vistas over Comrie and the Loch Earn basin. Melville’s monument can be seen from most of its holes, as can the quaint town of Comrie. 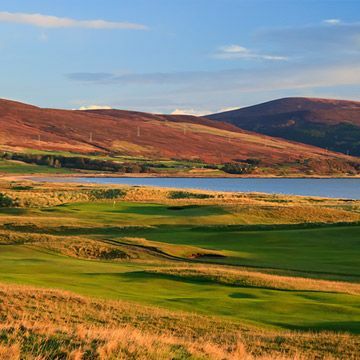 The golf course’s mesmerising views lull one into a false sense of complacency: but total focus is necessary to get around this fun but challenging course. The sign on the first tee reminds you that green keeping staff have priority (which would please my friend Alan the green keeper at Brora!). I suppose with the head green keeper being a past Captain and Club Champion, he is entitled to proper respect. James Braid would certainly be pleased with the condition of the course is first. And Braid definitely left this course with some amazing holes and plenty to look after. 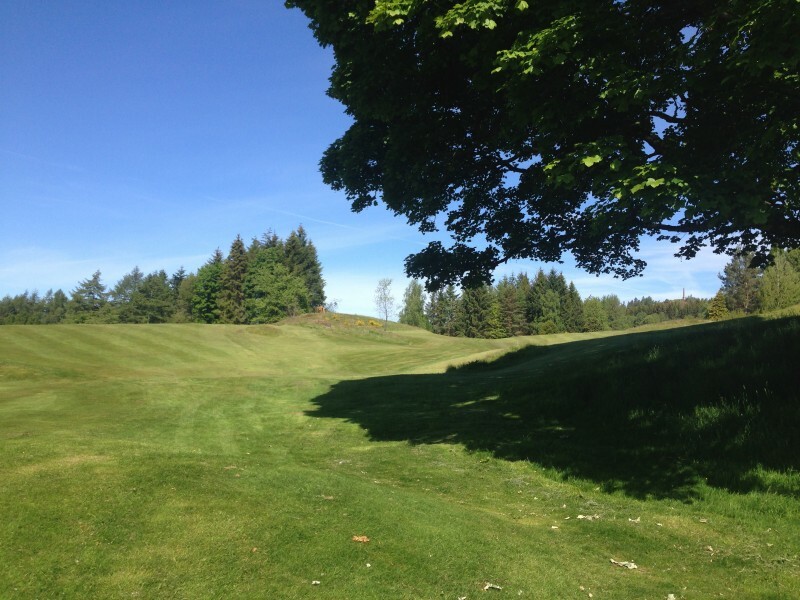 Women are off the black tees at Comrie as you can see below, but this adds to its charm. 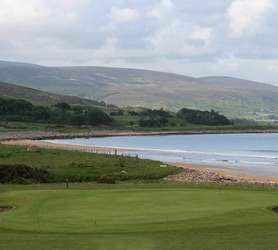 The first begins uphill but swiftly feeds into a downhill green protected by wicked rough on its outskirts. The second sends one back across the course to an uphill green. And then these two holes are followed by a short par three 3rd. It is even more dynamic, demanding a shot ‘true and sure’ to its elevated green. The fourth was my favourite hole. You are rewarded once you finally reach this uphill green with an amazing view of the surrounding mountains. It is called ‘happy valley’ and I was extremely happy to be there playing golf on such a lovely day. I was reminded of Psalm 117: ‘I will lift up mine eyes to the hills, from whence cometh my help.’ And I sure needed needed that help for the rest of the round! We had just an incredible day, and felt duly challenged by the course and its unexpected delights. Half way around we had to administer more sunscreen even though it was only 10:30, but were glad we did as temperatures soared. As we reached the 6th, I was actually pleased to go into the trees to get some shade. Its green is protected by two lovely trees, and the flag nestles behind them to tease you forward. 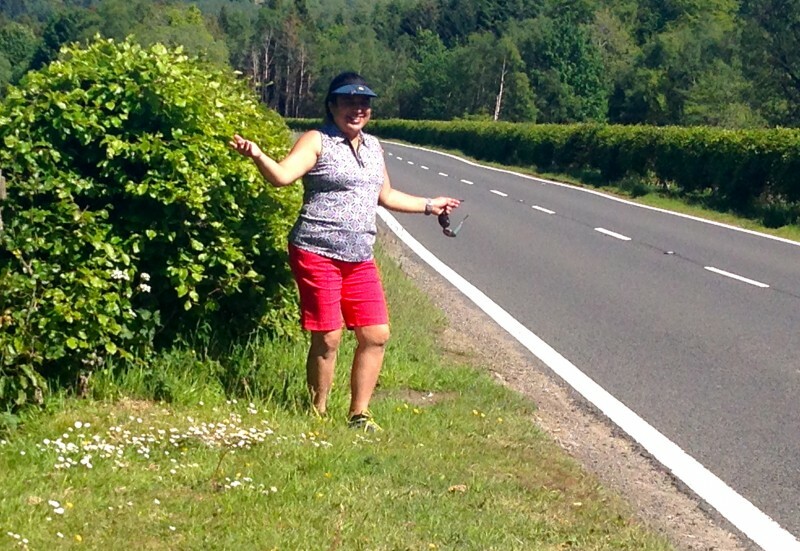 Marjorie, one of the delightful women members we met before our round, told us that it is from the 6th that the course gets its mascot, the capercaille. Apparently this beautiful bird makes its home in the tall grasses there. 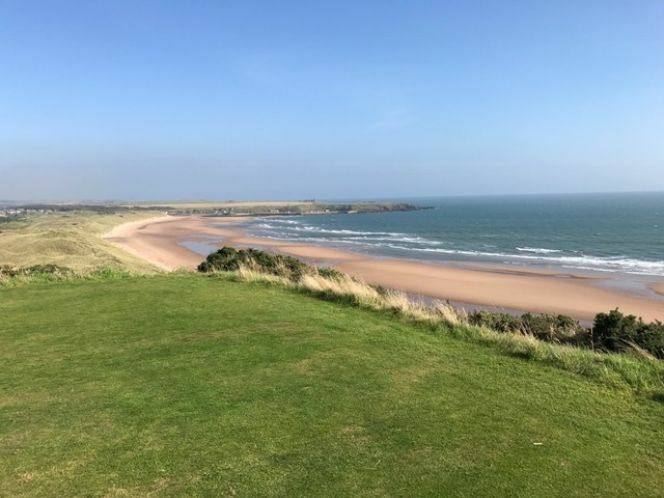 I don’t blame them: with the 6th taking one to the outer edges of the course, it definitely has the best views! We were certainly thrilled to finally find a par on the long 9th hole. And we duly celebrated our success by buying a local speciality, homemade Scottish Tablet, together with a couple of cold drinks. Unfortunately, the tablet was left in the car ‘for an end of day celebration’ - but it didn’t make it! Such a disappointing waste, but fortunately we know where to get some more! 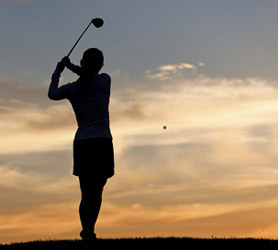 There are roughly 40 women members at the club, and many play regularly on a Monday and a Thursday. Comrie is also home to Carly Booth who is in America playing right now on the Women’s Tour. Carly has been a member of the Curtis Cup team. She continues to inspire women and girls from the area to take up the game and is a regular feature at the club when she is in town. 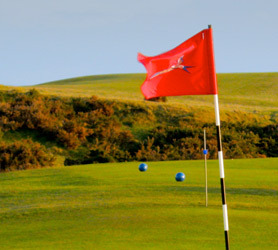 Marjorie also told us that the club runs many social events together with its golf programme. A highlight is what she referred to as ‘New Year’s Nonsense.’ This is when the course is played with torches in the dark with balls that glow and glow sticks lining the fairways. It certainly sounds like great fun and a perfect way to welcome the new year. 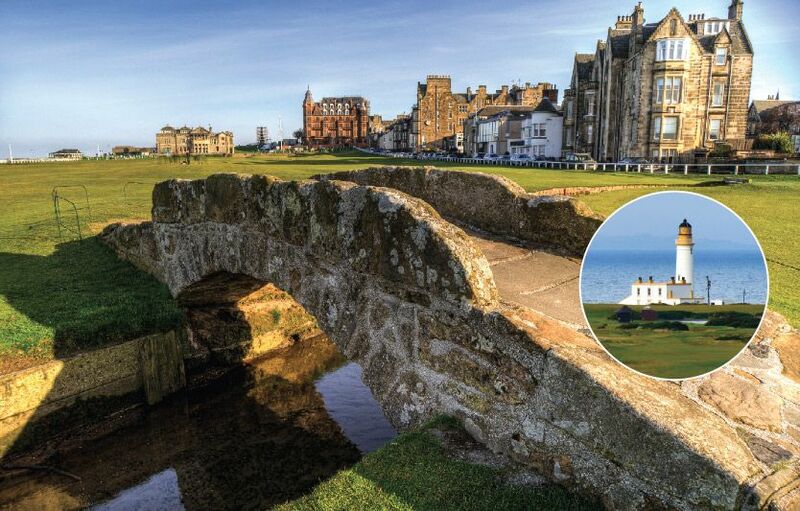 It must be something to behold and this ‘Lady of the Links’ is going to try to get back for the event if at all possible. But I am sure going to try to make it back before then as well! By the way, Comrie has another feature to its village: amazing hedges! It is a consistent contender, and often the winner, of the ‘Hedge of the Year’ Competition. I kid you not. So I had to make sure that Ann enjoyed the beautiful sight. She is pictured here with the winning hedge. And since then, when driving around, she has a new appreciation for the common hedge. It's a most important British institution. I hope you, too, will enjoy amazing Scotland's hedges and see them in a new light when you are next here. 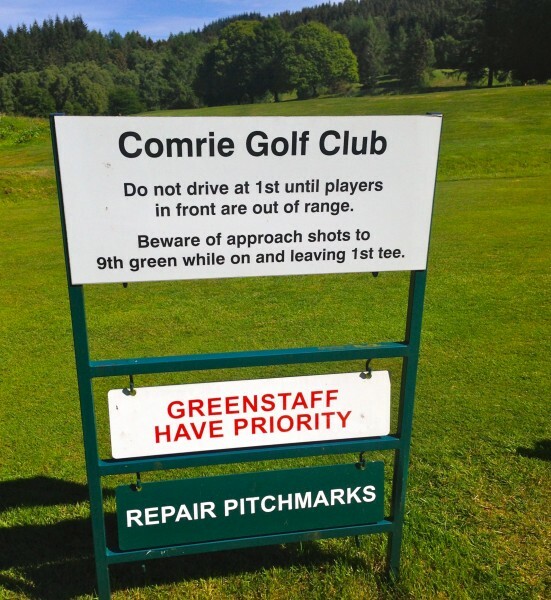 Footnote: Comrie Golf Course was just recently voted one of Britain’s best short courses. It is 9 holes, but has 5248 yards with a par 74 if one plays 18. 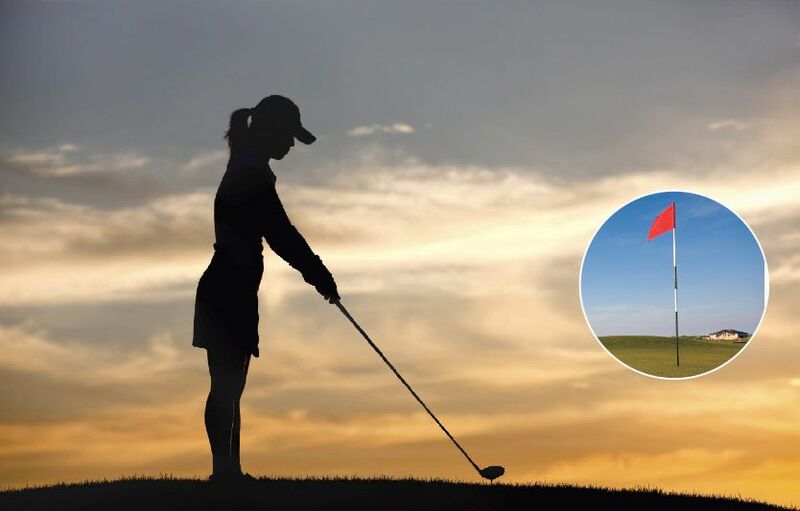 Women are full playing members and it offers many social events which gives the club a warm vibrancy complementing its terrific golf.